While a drone can be great to have, it can also cost a good deal of money. 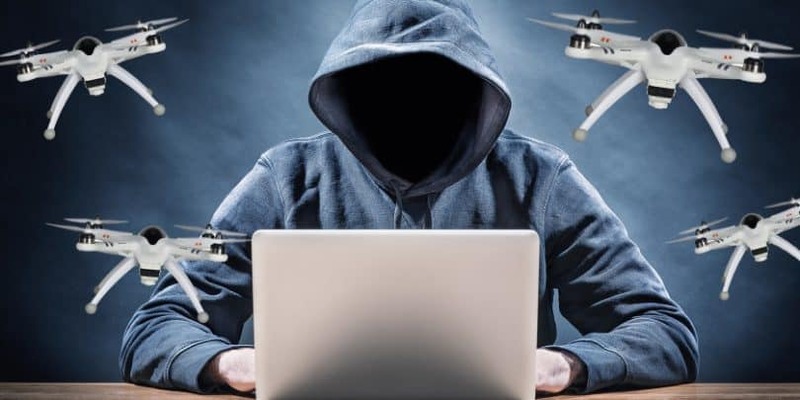 You will need to watch for what you are spending on a drone so you can find the best drones for the money you are open to offers. Fortunately, there are plenty of good drone models for you to choose from that aren’t too expensive. You must make sure you at least look at the right features before ordering one of these, though. Drones are available for cheap if you know where to go in order to find one. However, while many of these drones have some great features, you must see that they are appropriate for your use. For instance, you won’t be able to take amazing pictures with a toy drone or an FPV drone as they are built for other activities. This is even more important when you consider that certain models are difficult to use and get to know them. The HS170 Predator is a miniature helicopter drone that is available for around $50, in most places. This is a headless model that does not have any particular set direction in terms of where it will go by default. This means that the Predator can be controlled to move in any direction without you worrying about having to turn ahead in one spot. It features a quadcopter design that uses 4 separate rotors on its corners and it has a rectangular blue base. Each rotor has a border barrier on the side to protect the blades from getting caught in anything or being hurt by any debris that might fly in an area. 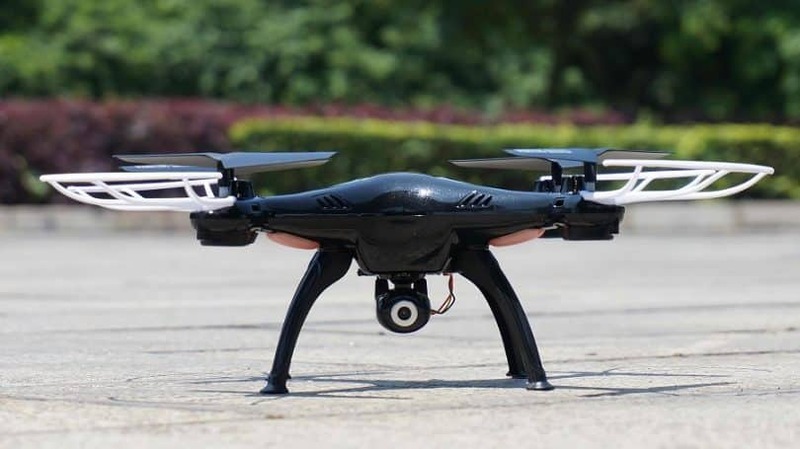 The 6-axis gyro stabilization system is used to keep the drone stable. 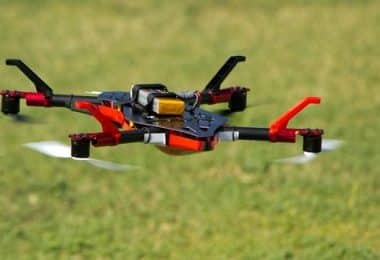 You can also fly it about 150 feet away from your receiver and it will still be easy to use even when there are a few light winds in the area. This can fly for about 6 to 8 minutes on a full charge and it only takes about 60 to 80 minutes for you to charge the battery up. The battery is removable and can be charged with a USB plug that comes with it. 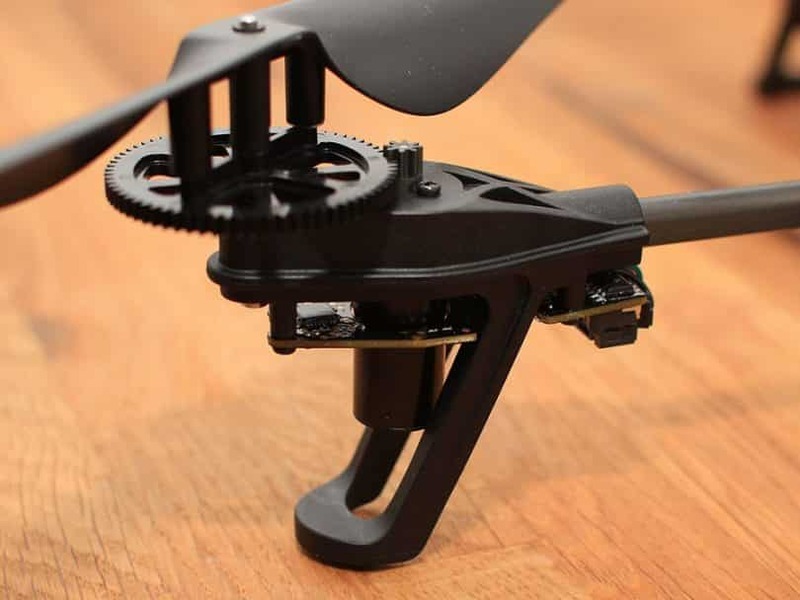 This quadcopter is also less than half a pound in weight. Therefore, you don’t have to get it registered. 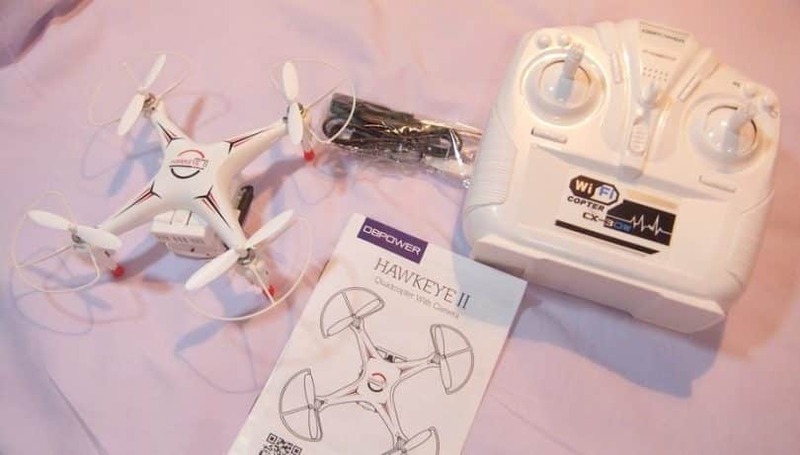 It can also be flown either indoors or outdoors as the 2.4GHz connection will ensure that this can work without any interference. Also, you can use more than one in the same room if desired. 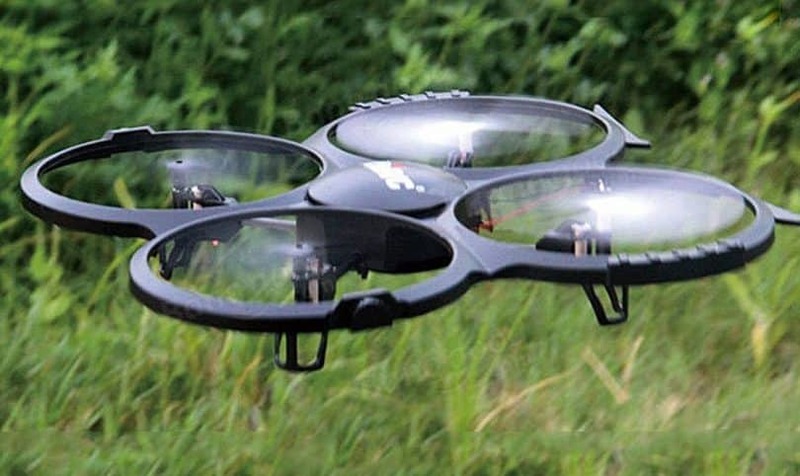 The UDI U818A is a quadcopter drone that is also headless and is only 4.6 ounces in weight. It uses a 2-megapixel camera that allows you to take pictures and videos and it can be supported by a 4GB microSD card if desired. The controller allows you to start the camera up and to take pictures that you can review later after the drone lands. This works with a circular base that has the camera built on the inside. The camera lens will come out from near the bottom of the drone. The four rotors and their blades are all protected by a full circular barrier on each one. You can use replacement blades for this drone if needed too. Two LiPo batteries are included in the package to give you more flying time. Each can offer 7 to 9 minutes of flight time on a full charge but each battery takes 90 to 120 minutes to charge up all the way. These can be charged up through a USB connection. A 2200mAh power bank that can also be charged up with a USB connection is also included so you can power up your batteries while on the go. The controller offers controls for the pitch, roll, and yaw. You can also trigger a signal light through the controller. You can even get this to pull off a 360-degree flip. 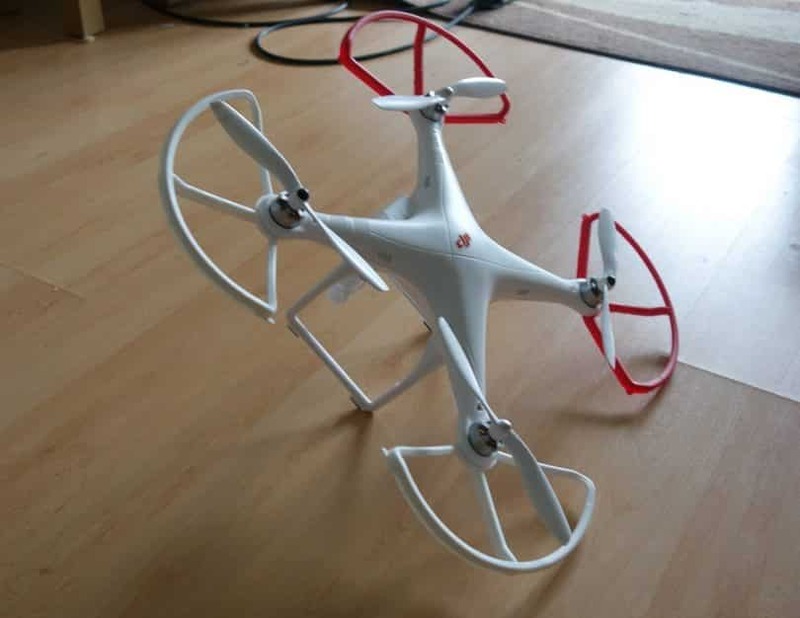 The light plastic frame is balanced carefully so you can pull off this and many other stunts and control functions with the drone. This can be found for as little as $100 depending on where you go to get it. For a much better insight on what this model offers, we suggest that you also read our UDI U818A in-depth review. Available for about $90, the DBPower FPV Drone uses a unique camera function. It uses a 2-megapixel 720p camera on its main body. This can link up to a mobile device like a tablet or smartphone with a properly installed app. As you use this, the drone can relay data from its camera back to you in real time. You can control the drone through a tablet or smartphone but you can also use the standard controller that comes with the drone. Either way, this works with a 2.4GHz controller that will respond quickly. It can also work for up to 250 feet away from you. 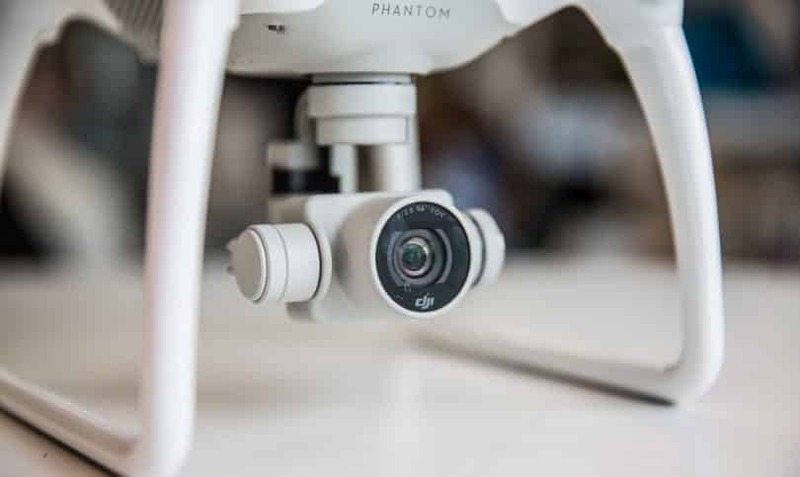 You must keep it within that range so the drone will not lose its connection to your mobile device while recording things on it. 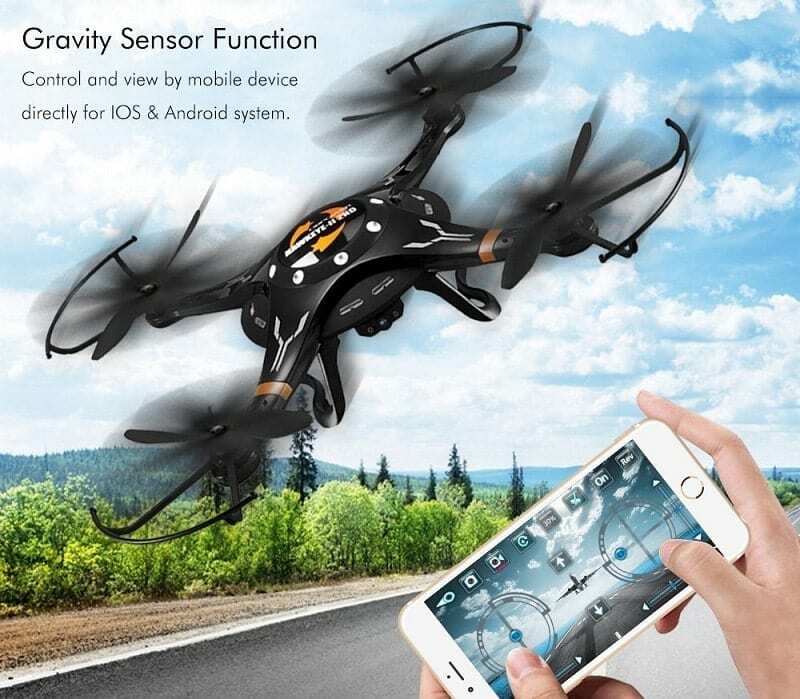 It also uses an anti-jamming function to ensure that you won’t lose control provided that the drone is within a proper range. 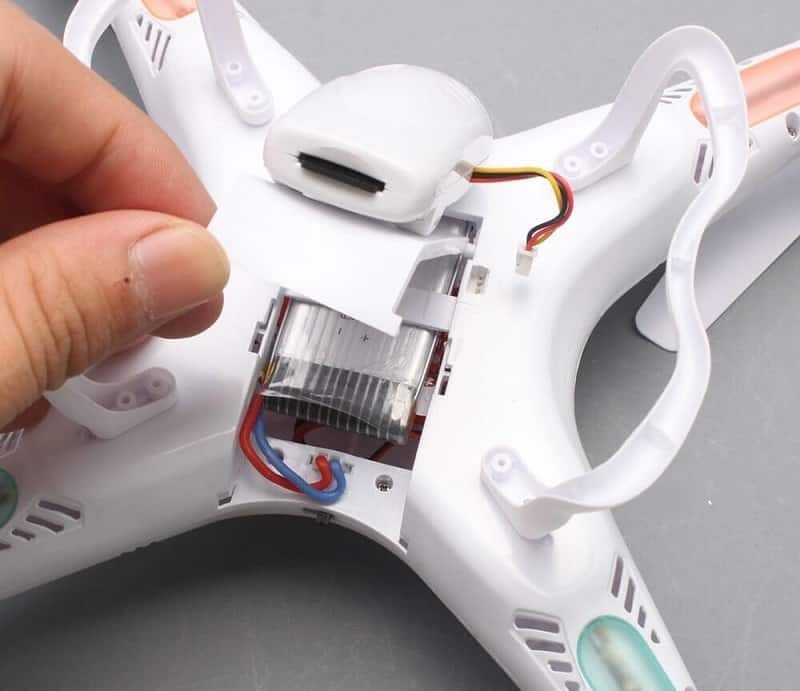 An air pressure sensor is also used on the inside of the drone. This will keep the drone steady as it will identify changes in the air as you are flying. It doesn’t take much time for you to get this to take off either. You can use a simple one-button control to get this to take off. The button is clearly labeled on the controller. The drone itself is designed to be very easy to use and convenient for a variety of purposes but is especially great for use in an indoor environment with plenty of ceiling space. The Syma X5C Explorer is a popular drone that goes for a little more than $60, but it can be found for closer to $40 in some instance. The Explorer is a 2.4GHz four-channel six-axis gyrocopter. It uses an HD camera on the base and has a clear opening on the bottom to make it easier to use. The camera works with a 2GB memory card to help you record a variety of videos while in the air. The buttons on the controller are easy to configure as well. The battery can work for seven minutes at a time. It takes 100 minutes for the battery to be fully charged. The bright white body is also designed to where you can quickly see the drone from a distance. This brilliant drone is wind resistant and uses a quadcopter design to make it easier for the drone to fly without shaking. It also uses a 360-degree flip feature that is easy to use. This, in turn, offers a great look that is easy to follow and work with when trying to fly well. You can fly the drone indoors or outdoors. The memory card on the inside is especially easy to add or remove. The controller is also designed with a simple setup that allows you to move the drone up or down and to the side. There are a few buttons to use for when you’re looking to get the camera to start working or when you want to perform a few tricks. For more information about this popular series from Syma, we suggest checking out our article that offers reviews of X5C, X5C-1, X5SC, and X5SW models. The Cheerwing X5SW drone is a good choice for an affordable drone in that it costs $60 to get. This uses a headless design so you can get the drone to move around without worrying about what direction is being favored while flying. This, in turn, improves how well the drone can move and is easy to use for many purposes. The 6-axis flight control system offers a careful setup that is easy to use. 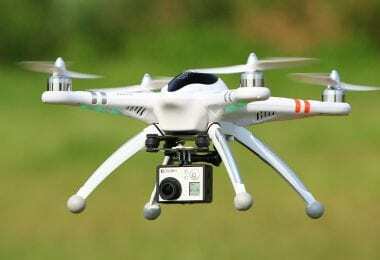 An HD camera is also used to recover videos and take photos while flying. It even supports smartphones by linking such a device to the camera, thus giving you a clear view of what’s going on in real time. You can use the cell phone holder on top of the controller to get a good view of the camera as you are flying the drone. A Wi-Fi link will particularly be used as the Wi-Fi connection that your device can use will be easy to use. Designed with a good quadcopter arrangement, this drone can travel up to 150 feet away from your controller. It can fly for about six minutes after you charge up its battery all the way. A left-hand control system is used on the drone. It ensures that more pilots of all skill levels can use it. A USB charger is also included. This helps to keep the drone, powered up. The drone battery can be removed if needed so it can be easier to get it to reach a proper charging port. 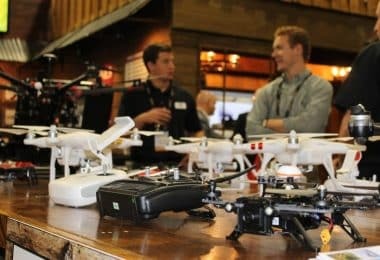 Regardless of the type of drone you want to get, you need to find something that has all the necessary features that can help you with keeping it in the air and making it more fun to pilot. That’s why we listed below the best features to look out for. What is the camera like? The camera should be used carefully. There are often times when the drone might come with its own camera to be very easy to use and pilot. You can get the camera to start running through a typical controller feature in many cases. In addition, the camera can be built right into the body of the drone to where it can easily be accessed in any case. Can it return via GPS? A good drone can come home due to a built-in GPS device. 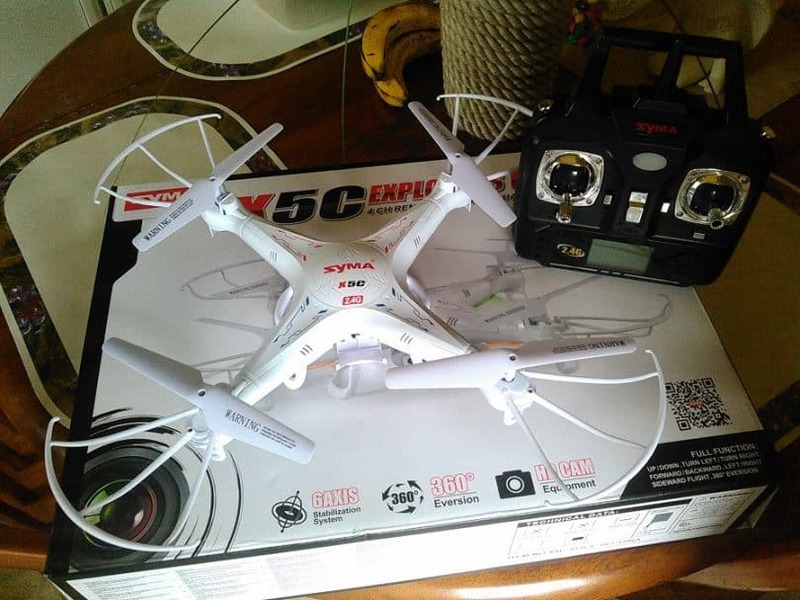 This will allow the drone to identify where the drone started up and will return it to a proper space when you either trigger a landing mechanism or you lose your signal with that drone. No matter what you use, you can easily get the drone to start working quickly. What is the battery like? The battery in your drone should especially be checked based on how well it is able to work. You need to see that the battery you’re using is not going to die out easily. Check to see that your battery is easy to charge up and that it can last for a decent time. You’re typically going to get about five to ten minutes of flight time off of a single fully-charged battery. Look to see if you’ve got more than one battery that comes with your drone or if you can easily find a second one elsewhere. This is to expand upon the total flight time that you’ve got. Prop guards may be used on your drone. These are strong borders that will be placed on the sides of your rotors. These should protect the propellers so they will not be caught in anything or at risk of breaking apart if the drone runs into something. Considering how many of these drones are small in size, you should ensure that they are protected with such guards. The ability of the drone or quadcopter to stay stable while in the air is important. You must see if the drone you order uses a series of corrective features to keep it from falling down or shifting its position. A good drone can come with a feature that will trigger how each rotor works based on how well the drone can keep itself steady. The key is to keep the drone from shaking or otherwise struggling to stay intact while up in the air. 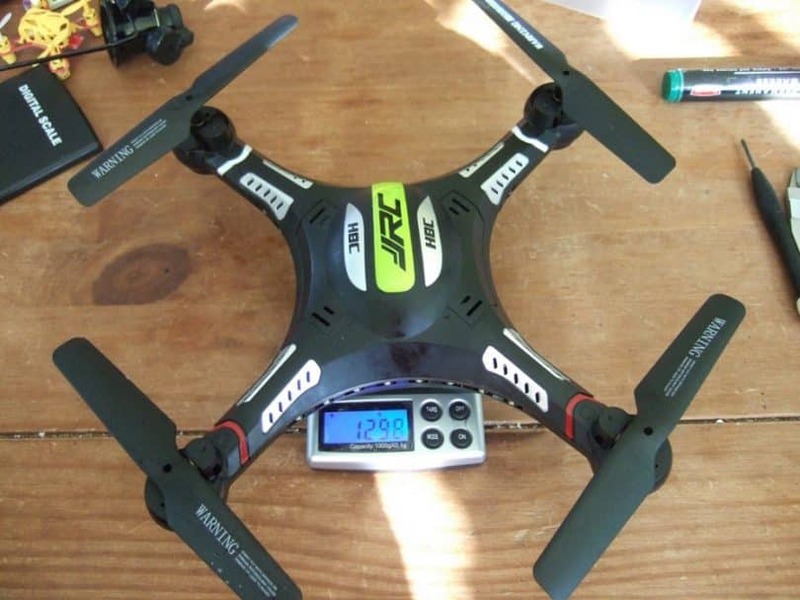 You need to make sure that a drone that you can afford is less than 0.55 pounds in weight. This is to ensure that the drone will not have to be registered with the FAA before it can be flown. Also, a lightweight model will be easier to control. It will be more responsive to the controls that you send to it. It will also be easier to lift off as necessary. Not all drones have landing materials but it helps to look for ones that feature small landing bars on their bottom surfaces. Such bars can be used to keep the drone from bumping around when you’re trying to land it. Either way, you need to see that your drone can be landed on the ground without worrying about it bumping around when doing so. The controller on your model should be reviewed based on how well you are able to control it and make it work as necessary. A good controller should be made to where it can not only move the drone around but also trigger some fun tricks like 360-degree flips. A controller should also have some features that can trigger a camera’s functions if the model has one. These are just a few of the appealing features that can be found in your drone. You should use these points with care when finding a great drone that is easy to fly around and won’t be too rough for use. Not sure which model to buy? There are many good pointers that you can use when figuring out what the right drone for you to get can be. You must think carefully about these pros and cons when finding a great choice. 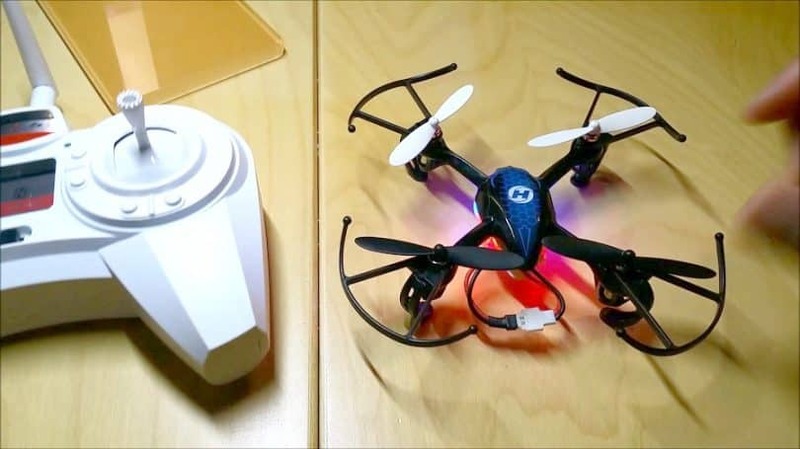 A small drone can be easy to pilot indoors or outdoors. A quadcopter model will allow for an even balance of power. This in turn makes it easier for you to fly the drone the right way. You can get a drone to fly at least 100 feet away from your controller in most instances. It can work in light wind conditions as it can easily correct itself. Many models are light enough in weight to where a unit can quickly move up and yet still not have to be registered with the FAA. The battery in your drone will not last for far too long. It needs to be recharged regularly. Not all drones will have their own cameras. The ones that do often have cameras that are not too strong and don’t provide you with a good picture. Proper guards are needed on the propellers or else the drone will be at risk of bumping into items and potentially cracking apart if not handled well enough. A world where drones can fly free is quite exciting but you need to look for a good model that is affordable and easy to maintain. Be sure to think about the options listed here so it will be easier for you to not only get a drone but also make it work properly. A quality drone can be attractive if used well enough to keep it in the air and to make it run as nicely as it can.